The Eugene Generals are proud to announce the signing of forward Jared Coday for the 2018-19 season. A native of Irvine, Coday is the second Southern Californian to have their signing announced in the past twenty-four hours (Devon Dunn - Burbank, CA). 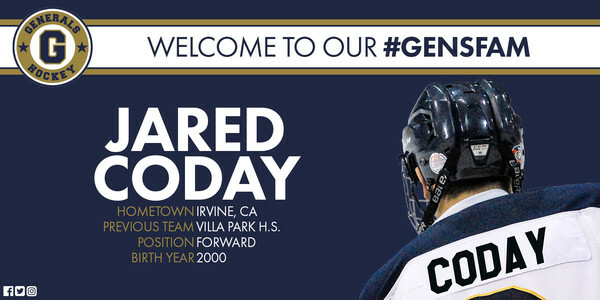 He joins the Gens having most recently played for Villa Park High School of the Anaheim Ducks High School Hockey League, and previously he played for the Anaheim Jr. Ducks youth organization. Along with Dunn, Coday also suited up for Team San Diego at this year's America's Showcase in St. Louis, Missouri. There, Coday posted two goals in four games played. Coday's performance in St. Louis piqued the interest of Generals Head Coach Justin Kern who was in attendance scouting for the upcoming 2018-19 season, and talks between the two began following the conclusion of the academic year. "After talking with Coach [Kern] and learning more about the program, I’m so excited to move to Eugene," said Coday. "It seems like a great organization to immerse myself in that will help me hone my game." "Jared has the ability to make some dynamic plays," said Kern. "He might not be the biggest player on the ice, but that doesn't stop him from making a tremendous impact. He's not afraid at all to mix it up and battle for loose pucks, and I can't wait to see the intensity, commitment and grit that he'll bring to the team." "I'm a sneaky forward," added Coday. "I'm not the biggest guy yet, but I like finding small windows, being able to see where the puck is going and ultimately just putting it in the back of the net." While his love for the game is clear, hockey wasn't the only deciding factor for Coday when it came to picking his destination for the 2018-19 season. "I love Oregon," said Coday. "I'm kind of an outdoorsy guy, so I've always been intrigued by the state. Beyond that, it's just nice to be able to play junior hockey without having to move too far. It's great to have this option here in the Pacific." Looking ahead to arriving in Eugene, there is a lot that Coday is fired up about, but one thing sticks out above the rest: meeting his new squad. "I'm just super pumped up to get to the city and meet the boys," said Coday. More signings are anticipated in the coming days and weeks as the Generals gear up for the team's fourteenth season of play. Preparations for 2018-19 continue with the Eugene Generals Training Camp which is scheduled for August 10-13 at The Rink Exchange in Eugene, Oregon. Spots are still available and you can register now at EugeneGenerals.com.